Like many of our patterns, this dress has been wandering around in the back of my mind and on the pages of my sketchbooks for quite a while. This season it finally makes its debut. I love the look of a drop-waisted dress. It’s sweet and feminine while also being a relaxed style that’s easy to wear. It’s also a very versatile style, and this dress will take on very different personalities depending on your fabric choices. I’d love to see it in a dressy fabric like silk dupioni for special occasions, but it will also be a terrific play dress this fall made up in a fine-wale corduroy or in our new brushed cotton, which feels soft and cozy like flannel. 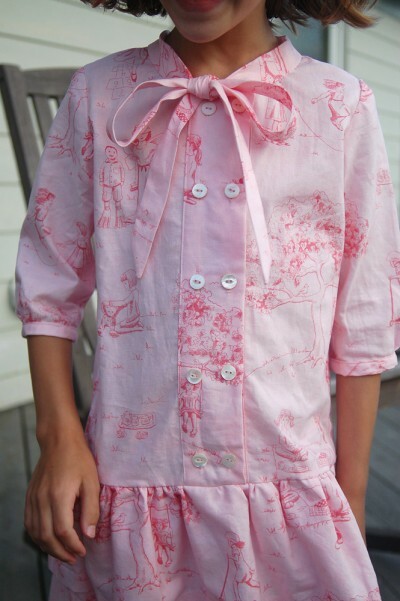 And of course it looks really cute in quilting cottons and in shirtings as well. I’m a sucker for a good yarn-dyed stripe. The styling is a little bit vintage but still very contemporary. The wide front placket looks double-breasted (it’s not, however, because that would put too many layers of fabric all the way down the front of the dress, which would make it stiff and uncomfortable to wear), and the tie at the collar is cut on the bias so it drapes nicely and makes a soft bow. 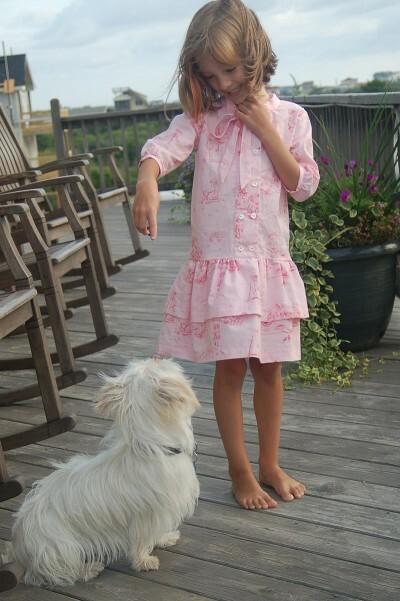 You can choose from 3/4-length sleeves or long sleeves, and you’ll get two completely different looks with the double ruffle at the hem or the single ruffle. And if you really get carried away,you could also make a cute tunic using just the shorter of the two ruffles, which would look really cute with leggings or jeans. I personally like this style best when made up in a solid color or a simple, subtle print or texture. The pattern works very nicely with the toile from our upcoming Cape Ann collection, as shown in these photos, and would also look great in the ticking stripe or in the smaller prints from that collection. It could be a lot of fun in the right big, colorful print, too. And what about using two different prints for the two ruffles? See, I know you’re going to make some interesting and unique dresses from this pattern. This pattern, as well as all our other fall styles, will be available during the first week in September. Cannot wait for your new patterns. Of course, I already have a backlog of stuff to make with the Oliver and S patterns I bought this past month….. I am so excited about this dress!! I already have fabric waiting this pattern. This dress is so adorable. I’d love one for myself in corduroy! S. looks gorgeous. She’s getting so big! S looks so sweet. 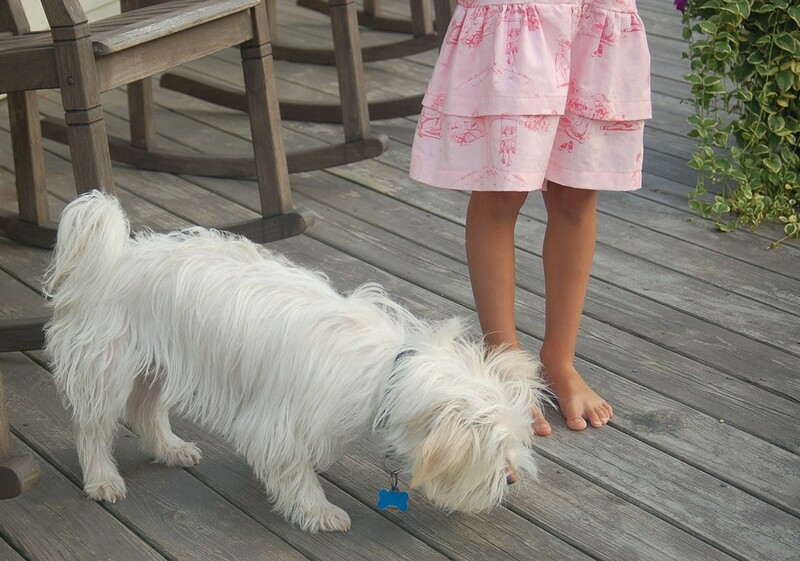 Love her little sun tanned toes. I am in love with this dress pattern. I wasn’t sure at first glance but now seeing the pictures of S I know that I will be picking it up. Thanks so much for the great inspiration. This dress is growing on me – I’m loving it in the pictures you’ve posted – but I haven’t seen a single layer skirt yet. Any pictures of that view? I love this dress, Liesl. I may find out if I can use this pattern for a school uniform. It would be so nice in solid twill. So darling. Wish my girls were young enough to wear this dress. It would have been a number one pick from them. Oooh – I want to see the other view as well! Love your suggestion to use the shorter of the layers to make this a tunic! That will work perfectly for my tween girls, I think. 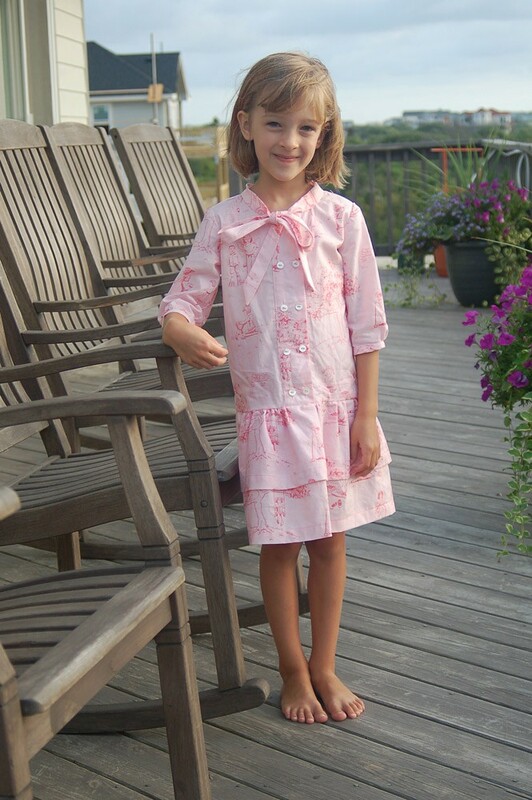 This is my favorite girl’s dress pattern ever! Thank you Liesl. I bought some fabric for a Jump Rope Dress a while ago but now I will definitely use it for this one. This is just so sweet! 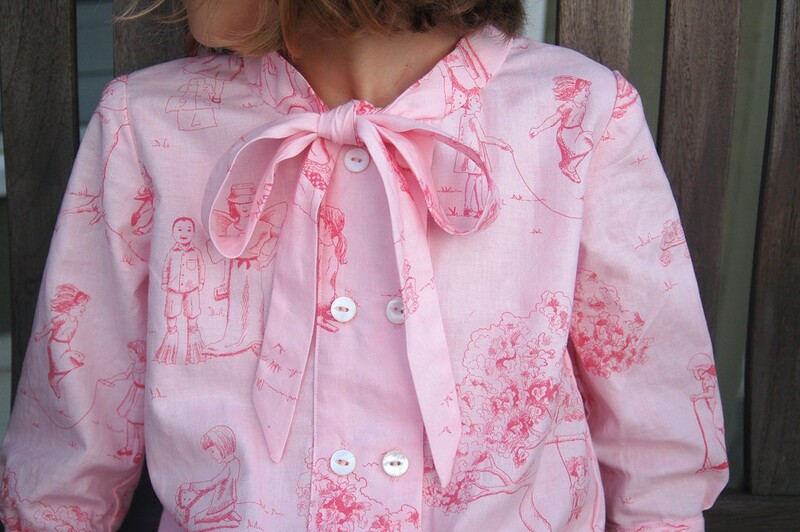 Your toile is a beautiful choice for it too! I love the free pattern I just printed it to give to my older sister she has been so busy she doesn’t sew anymore. She made my wedding dress and my youngest sisters wedding dress she is the reason I make quilts today. I am a longarm quilter. I would love to give her some of this fabric to go with the pattern I printed for her. She has twin grandchildren they are 3, a boy and a girl they have a older brother that is 4. I hope this inspires her to sew again. Thank you so much I am going to find the patterns so I can buy them for her.